The British high commissioner in Ghana his excellency Gordon Wetherell has indicated that more than 2000 Ghanaians travel to the United Kingdom to study every year. This he noted was due to the fact that studying in the UK is a good option for the value of money. Speaking at the opening ceremony of the Education UK Ghana fair 2004 in Accra, he noted that not bad for a country with just one percent of the worlds population, over 90,000 international students are currently making the most of their postgraduate opportunities in the United Kingdom. Stressing the need for pursuing education in the UK, he indicated that the British way of learning has inspired education systems in the world over and is still among the most valued and successful which always place great importance on the ability of students to work independently and to develop their own thinking. Further in his address, Mr. Wetherell stressed that UK higher education institutions offer internationally recognized qualifications acknowledged to be of the highest academic standard with all its institutions subjected to a range of quality assurance checks and quality ratings published for all to witness. He again disclosed that Ghanaians student in UK stood to benefit from the strong links between institutions, business world and their professions. He noted that the number of UK alumni who return to Ghana after their study in UK contribute immensely to community development by fostering and supporting associations such as the Chartered Institute of Marketing-UK (Ghana branch) and the good work they undertake to develop others professionally. "UK universities do of course benefit financially through the presence of Ghanaian students, but at the same time Ghanaians benefit through exposure to an international environment with the UK benefiting from the cultural interchange with Ghana". 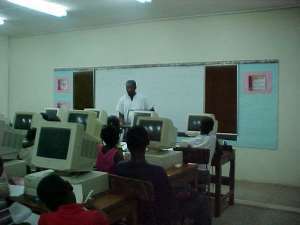 On his part, the director of the British council, John Payne indicated that the programme was amongst the over sixty UK education promotion exhibitions organized yearly by the council world-wide, but the first promotional exhibition in Ghana with the objective of highlighting the excellence of UK education and the range of study/training opportunities available for Ghanaians. He stressed the core objective of the fair was to display the variety of study/training opportunities offered by UK educational institutions, provide first hand information to potential students, facilitate the establishment of links with employers, alumni and education agents in Ghana and to also educate prospective students on visa application processes and requirement. He has therefore advised all prospective Ghanaians students to use the opportunity at their disposal to achieve the best in education, as it is the best investment one can make in life.